We had a wonderful time, and enjoyed our comfy condo. We had a great experience at the Inn. The condo was clean, and staff very accommodating. We enjoyed the gulf view, and relaxing atmosphere. What a beautiful place! The island AND the condo! 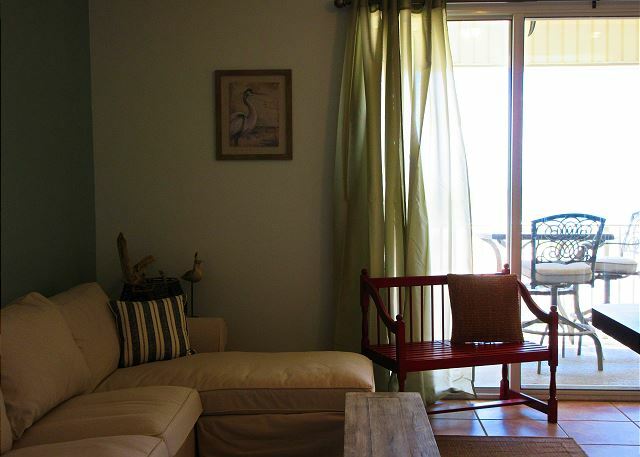 Great location, beautiful beach views, clean, well decorated and relaxing!Perfect for a couple or even a small family. Had everything we needed and a quick walk to beach. We had a great time, lovely rental, very clean, great location and view. We did agree with previous posts about the weirdly hard mattress, but brought an egg-crate type foam pad and slept well. The place could use more wine glasses, just some regular ones would be great. Really loved that the balcony furniture was bar height, so when you sat down, the horizon and the railing did not coincide, as at many other rentals. We rented this location for the view, so that was perfect. Loved the bike trails on the island, as well as the bird sanctuary. Totally quiet and relaxing weekend. Fabulous stay - would do it again! It was a great place to stay. Love the island. Very nice and relaxing. Great Getaway in the Gulf ! Nice, clean condo with a beautiful view. Fully functional kitchen and comfortable accommodations. We’ll definitely rent this location again when we come from California to visit our son & family. Food was amazing. We suggest Skinner’s Seafood and Lighthouse Bakery. We enjoyed our stay and are considering returning in the future. 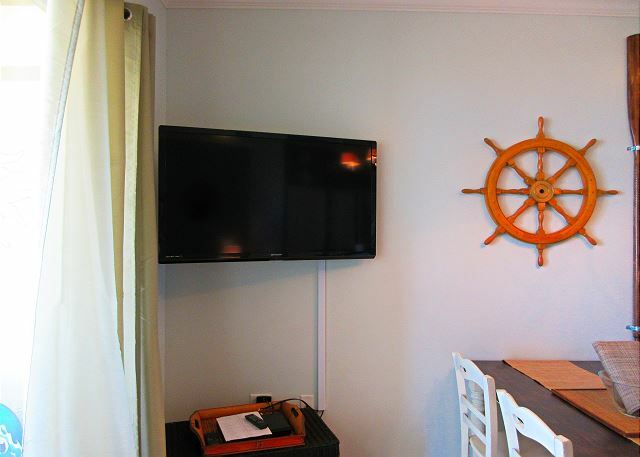 Very comfortable, relaxing, close to beach....everything we needed. Problem with washer but manager let me use another unit’s washer. Would have been a problem if we were staying longer. We absolutely loved it there!!! Very clean and nice!!! We had a great stay and beautiful weather. and plan to return next year. Beautifully decorated condo. Gorgeous gulf view from the deck, could hear the waves all the time. Very comfortable couch and bed. Well furnished kitchen. Heated swimming pools, well maintained. Very clean. Would definitely stay here again and recommend it. Loved our stay on Dauphing Island. Our condo was perfect for my husband and I. It was beautifully furnished and equipped with everything we needed for our week stay. We loved the option of enjoying the beach or pool. We brought our bicycles to explore the island and the bike racks in the parking lot came in handy. The staff was friendly and the check-in/out process was easy. I would highly recommend The Inn and Dauphin Island. Both are gems. Bailey S from Lebanon, Tn does not recommend this vacation rental. We enjoyed the unit. It was clean and fully equipped. Only problem was when we went to use the grill on the porch, the plug did not work. As for management, they where friendly, however, after spending 8 hours on the road, we asked if the unit would be ready early. It was and they gave it to us an hour and a half before check in, but acted as though we were stealing from someone. For that reason, I would not return. If the unit was not ready, would have understood. If it is ready, what is the harm in letting us in earlier. Our third trip to Dauphin Island and once again we had a great stay. The rain though daily was very cooperative and gave us plenty of time for the beach and pool. 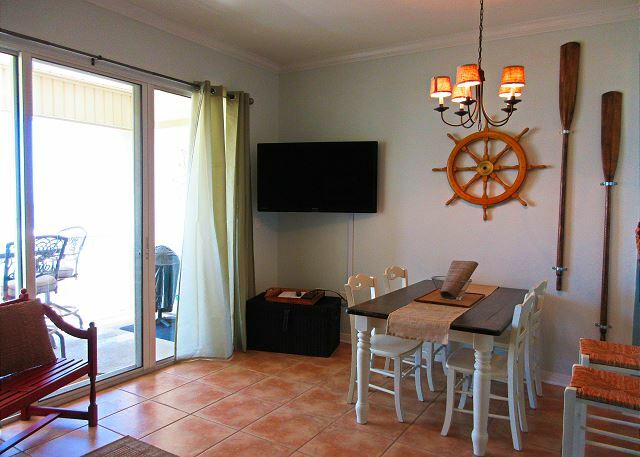 As for our condo it worked out great for us and was clean and well furnished. The only complaint was the bed, which may be the firmest mattress I ever slept on and drove my wife to the bunk bed. We would recommend a topper which can be used by the guests but removed for the owners who may need such a mattress. 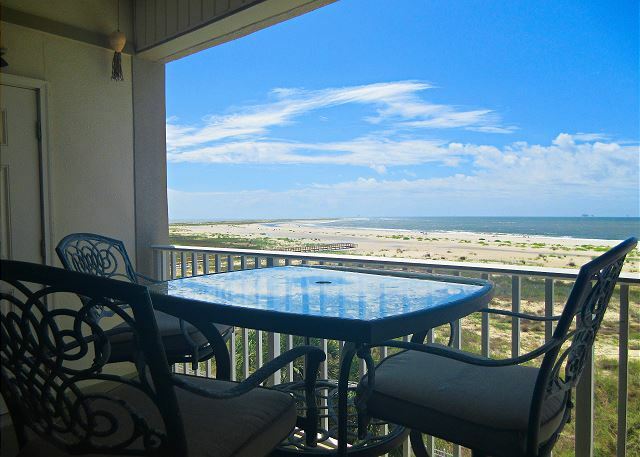 We would however be happy to rent this condo again on our next trip to Dauphin Island. Stay was excellent. Friendly employees and Clean Facilities. I would totally recommend this to a friend. Restaurants and surroundings were low key and exactly what we were looking for. Very kid friendly. The Condominium location is very easy to get to and nice parking lot. The checkin process was very easy and staff was very informative. Unit 406 was very nice and clean. A lot of space for an one bedroom unit. 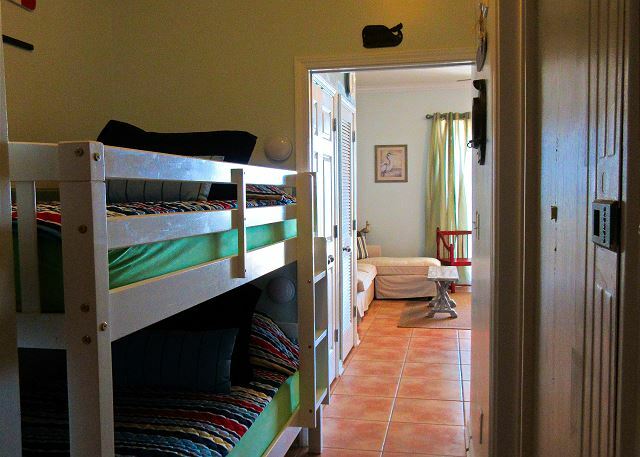 The bunk beds are great and the extra 1/2 bathroom was a nice feature. The view is amazing from the 4th floor. The unit was equipped nicely with kitchen items and furniture. The only thing I would recommend is an additional supply of toilet paper and trash bags. 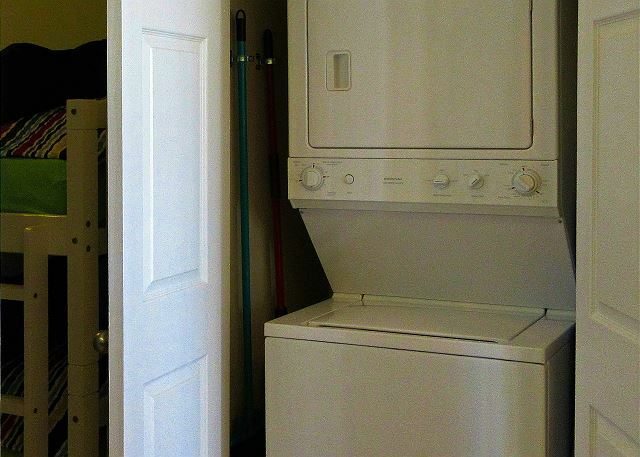 In past rentals in other areas, these two items are supplied by the unit. The area is very quiet and beach access is very easy. An outside company provides the rental of chairs and umbrellas for the beach. The two pools allow for plenty of additional swimming space when ready to leave the beach. My family will definitely return to this area in the future. Great access to the beach. Very comfortable stay. Would recommend! It was very nice. However the unit didn't have a functional DVD player. The kitchen sink leaked. Bed was hard as a rock, which was ok for me but not for my wife. a guest from Knoxville, TN does not recommend this vacation rental. Dauphin Inn is a great location on the island and we liked the gated parking. Loved the beachfront patios and the Island! Unit 406 was ok for two people but would benefit from new linens for the kitchen, bathroom, and sheets/pillows for bedroom. It would have been difficult to prepare and serve a complete meal as there were really no mixing bowls or serving pieces; that wasn't a problem for us as we ate out for most meals. Furniture on patio was unmaintained; very weathered. We had no contact with property management but sufficient written instructions/directions were provided. Building and outside property were well maintained. Quaint, quiet beachfront, a very relaxing experience. NOTE: there is little quality in restaurants on the plan to bring your own food and eat-in. As you can see from the photo, you view is far greater and any beachfront restaurant. Our stay was the perfect relaxed getaway. Clean, efficient, comfortable, nicely equipped unit with a spectacular view. Friendly and helpful staff. We loved every minute. 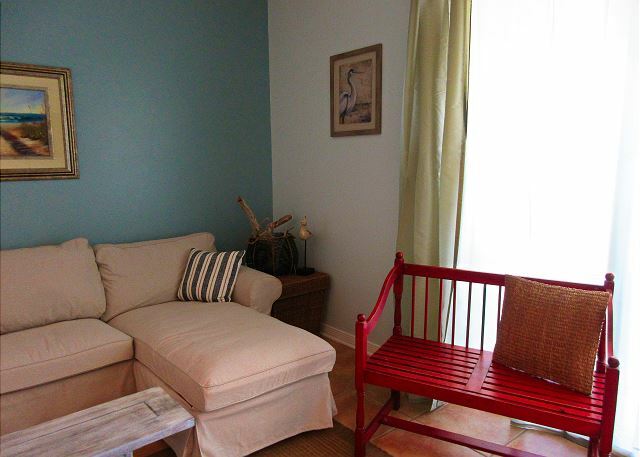 This condo is a bit on the small side, but perfect for two people! The kitchen had all we needed for breakfast and lunch prep. We spent a lot of time on the patio taking in the views! We enjoyed our stay and would stay in this unit again. It was perfect for us. My husband and I wanted to rest, recupe and enjoy the beach. This trip had it all. The condo was quiet, the pools were wonderful, the beach was uncrowded, everything was perfect. We have already booked for a week next September and can't wait!! We are telling everyone about The Inn and the island! The condo was clean and close to the beach. It was a little small but OK for two people. We were very pleased with our unit for the entire stay! It had anything we could have possibly needed. These pictures on the web site don't do the unit justice. High ceilings, crown moulding, beautifully decorated. The balcony has a wonderful view of the gulf where we were able to watch the dolphins swimming and jumping out of the ocean one morning. When we weren't on the beach, we were enjoying the two pools The Inn had to offer. We loved that the beach was not crowded here. My two children (ages 8 and 3) used the bunk beds to sleep in and had a fun adventure sleeping on something they don't normally get to. My only suggestion to the owners of the unit would be to install a railing on the top bunk and some way to climb to the top bunk. My 8 year old had to be lifted up there. Simply for safety purposes and peace of mind for the parents, the railing would be helpful. It's a long way to the tile floor if someone fell off while sleeping. 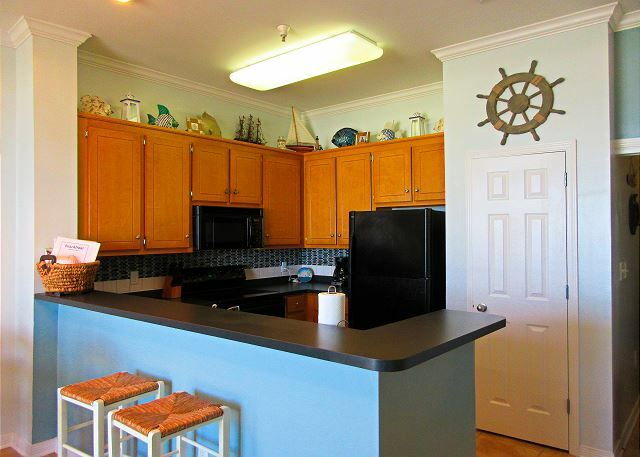 Otherwise, we had a wonderful time on Dauphin Island and in this unit! We loved The Lighthouse Bakery for breakfast, Barnacle Bill's for eating out and we enjoyed steamed seafood in the condo from Skinner's one night. Delicious! And, Skinner's was very affordable for a family of 4 compared to eating out at a local restaurant. Our vacation was built around a day camp for my 8yo at the Dauphin Island Sea Lab. Wonderful experience for her! Got to explore areas of the island we would never have known to go to. $50 well spent for a valuable educational experience! We will definitely be back to Dauphin Island and absolutely will be back to The Inn! We have been going to Dauphin Island for 18 years and this is our first time staying at The Inn. Wonderful condo! We liked it so much we are heading south for another week. The unit was clean and had everything we needed. Very safe and quiet. We actually had two different rentals. Both were exceptionally clean and well-suited for our needs. The staff at the Inn were awesome! Everyone took time to speak with us and thoroughly answer all questions. Major thumbs up to Tim Mahn! This condo is really homey. Don't let the photo of the sofa put you off. Its really nice. We had a great time. The condo was perfect with an awesome view of the gulf. The room was terrific. Even having the workman there was not too disturbing and showed the care in the building. Sitting on the terrace reading a book in the sun was just delightful. The property and location were great. However, the outside of the building was under repair during our entire stay. We were notified by phone(just a few hours before arrival)that repairs were occurring. We listened to machinery between 9:00 - 5:00 every day. Very nice trip. Always enjoy DI. First time to stay in The Inn or any of the condos. Weather was great. We had a wonderful stay at the Inn at Dauphin Island (406) As a last minute booking on a busy week we could not ask for a better deal. It was clean, quiet and a wonderful place to relax. Some repairs are needed. Says it sleeps six but the sleep sofa sags and you can not sleep on it. We really enjoyed our stay. The condo was clean and comfortable. The beach was pretty and deserted. We arrived late and our key was ready. The staff was friendly and we had no problems. We had a wonderful stay. 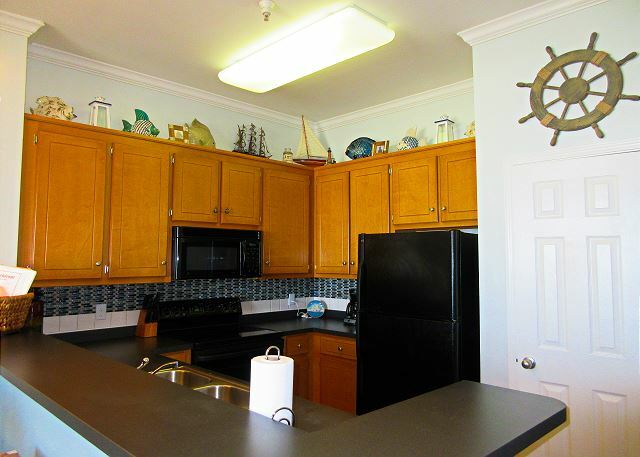 The room was clean with a well stocked kitchen, plenty of towels including beach towels. We had a great view of the gulf. The whole inn was quiet and comfortable with a pleasant staff. The carts were great; only 1 trip up the elevator. The only thing I could have wished for was a hair dryer, since I forgot mine. a guest from Glens Falls, NY does not recommend this vacation rental. Great beach and pool at the Inn. Staff was also very friendly. However, 406 needs serious updating. Leaky kitchen sink faucet, rust in the freezer, VCR player (yes, VCR player) was broken, carpets were dingy. Had a very good trip, room was clean, nicely stocked, management very friendly and helpful. Had one small problem, they took care of it immediately. Felt very comfortable and safe, easy access to room with gated parking. Wish they had a longer boardwalk to the beach, since my wife, and I am sure she is not alone, has had two knee surgeries, and the long walk to the beach through the sand was extremely hard on her. Overall very pleased and will be back next year, and may possibly between now and then, purchase one of the units for sale. Would like for the management to have menus from local restaurants either in the rack downstairs, or in the rooms. a guest from Mobile, AL does not recommend this vacation rental. Property was in a good location with a great view. However, the furnishings and unit were very dated. Linens were old and uncomfortable. Wonderful! Planning to come back again. Was perfect for our family of four. Great location right near the beach. Condo was in excellent shape and the staff was super helpful. Perfect vacation, loved the condo and the area. Will stay here again. Words alone can not describe how wonderful the staff & the condo was. Although I stayed a short time, I could not have asked for a better place to stay. Thank you. a guest from Ruston, Louisiana does not recommend this vacation rental. No instructions were given for late arrival prior to stay, so had to call twice once arrived. Very disappointed that the condo had not been cleaned prior to our arrival and had to clean it ourselves before we could unpack. The kitchen and bathrooms were gross. The electric grill, which we had to clean prior to use, did not work properly so we had to continue cooking our food in the oven. One of the toilets had problems. The balcony table was filthy. Our report of all of this at checkout was met with only a half-hearted apology. At least a partial refund should have been offered. Not a very relaxing vacation. 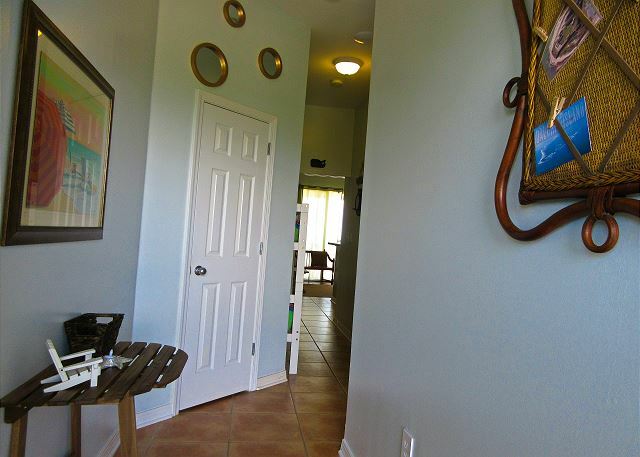 I loved my stay at The Inn on Dauphin Island. I stayed in three different condos. They were all unique in décor. The view was the same which was awesome. I am looking forward to returning next winter. Excellent, all around. One consideration for unit 406, specifically. The TV sets belong in The Smithsonian. Awful, old, blurry, creepy sound. I was told most units have fat screen. A general consideration, the Internet supplier is very unreliable. Almost daily, there were outages from 10 minutes to 3 hours. All else is fantastic at The Inn , and dauphin in general.